The Broken Sword series has a long history of releases all the way back in 1996 with a wide multi-platform release of the first game in the series, The Shadow of the Templars. The games in the series have slowly been making their way to newer platforms with the recent release of Broken Sword 5: The Serpent’s Curse being the first in the series to launch on the Switch. The Serpent’s Curse is a port of the 2014 release of the same name which had launched previously on home consoles, computers, and mobile devices. The game uses 2D hand-drawn, animated characters on top of beautifully rendered backgrounds throughout its campaign story and is a point-and-click adventure game with some great puzzles and character dialogue throughout. Prior playthroughs of any of the Broken Sword games is not required, though there are some character interactions and dialogue trees that contain callbacks to previous games in the series, especially with characters like Laine and Lady Piermont. I had not played a previous entry in the series and was fine jumping into the game with nothing more than my love of point-and-click games and crime dramas. The game starts you off with a light backstory introducing the la Maeldicció, a painting owned by a family in Catalonia, Spain, in 1937. This backstory comes around mid to late in the game and is the main set piece that becomes the focal point of your unsolved case. Broken Sword 5 starts you off in modern-day Paris during an art gallery exhibition where George and Nico witness a murder during a theft of the unusual painting. From there you spend time playing as either George or Nico, shuffling around crime scenes and traveling to homes of suspects as you collect clues and interrogate people close to the crime. Because you jump between George and Nico, the game has a sense of partnership and almost co-op like play as the dialogue options differ from the character, as well as their methodology of how they get witnesses to spill the beans. George is a bit pushy in how he asks things from people, whereas Nico tends to use both her street smarts, as well as, her feminine allure to get what she wants. Both characters are smart in going about their detective work and the conversations with each other, as well as NPCs, is often written with tidbits of helpful clues. Your quest to find both the killer as well as the original owner of the painting takes you to a couple locations around Paris, all of which are beautifully drawn and have a layer of detail to them not often seen in point and click games. Some of the gameplay elements reminded me of Professor Layton games and their puzzles or the 3DS Hotel Dusk series. There are some of your typical, shift letters to spell something, or attach wires to start a car-like puzzle, but the way in which you interact with the world and the way in which you gather items to your inventory is well done and polished. In Broken Sword: The Serpent’s Curse your main gameplay focus is finding items you can interact with, talking to characters through various dialogue options and solving puzzles or assisting people with their needs. Some puzzles and dialogue options only open up after you help someone or discover an item that is now usable to create a diversion or unlock a doorway or box. The game is very linear in that way and will even ‘keep’ you in a section until all the puzzles have been solved. The game does have a bit of a slow building pace to it, which is not to say that it’s terrible or a slow burn, but the game is one that can be played in more of a relaxed method. As you solve puzzles in each section you begin to learn more about the murder, the people behind the heist, and the history of la Maeldicció. During the campaign, you will meet colorful characters like Lady Piermont, Inspector Navel, a shady art buyer Medovsky, and many others. There are some ‘throw away’ characters that are only really there to impede your progress and add little to nothing to the story. There aren’t many of these tertiary characters and the ones you do encounter lend themselves to some of the game’s most interesting puzzles. I just felt like their inclusion often was just there to pad out the time I spent in a certain section of the game. During your playthrough, you will discover a lot of items. Some of these items are used more than once, which is a neat way to give some life to items that otherwise would be a once and done kind of thing. The way in which you use items is also pretty cool in how some items can be paired with another item. In one puzzle, a piece of chewed gum and an ID card was paired together and used to grab a key that had fallen in a slot in the floorboards. The inclusion of multi-item puzzles makes for some very cool set up in how you use your inventory and often gave me more ah-ha feelings once I figured out a once thought obtuse puzzle. Throughout each section of the game, you will need to interact with people, either showing them an item, or talking with them. During those dialogue sections, there are tons of spoken dialogue and each character is acted really well and enjoyable in the game. There are characters that you will hear a lot, like George and Nico, and it should be noted that they are well acted for the most part, delivering their lines with tempo and clarity fleshing out their character traits. I really enjoyed the conversations with Laine the most who comes as a bumbling idiot almost gorilla-like in his tone and animation movement. Inspector Navel starts off as a prudish, unwelcoming character when you first meet him, but his character does get better as you go through to the end of the game. There is a lot of voice recorded for the game and sometimes you will sit through minutes of dialogue/cut-scenes as someone tells you their part in the story. I am not a fan of games that just talk to me, but in Broken Sword it was a nice addition as both the dialogue and animation was done really well. The game does have a decent amount of music tracks in it but nothing is really memorable or stand out for me. The Parisian sounds of crowds and ambient music did well enough to make me feel like I was walking the streets of the city amongst the hustle and bustle of the occasional passing of cars and people. As you solve puzzles and interact with the world there are a ton of sounds that accompany the items you will find. From the annoying horn honk or simply click of a secret drawer opening, to a segment where some audio plays on a record player each bit of sound will immerse you into the game and give queues as to where you need to go next. While playing through the Broken Sword: The Serpent’s Curse I never came across any crashes or glitches in the game. The puzzles all loaded properly without any hiccups as well. When it comes to the things I hated, it usually boiled down to me getting stuck on a puzzle that I wasn’t paying attention to the items I had picked up and how to use them in the game or not listening closely enough to a character needing something specific or giving me a clue as to what to do next. I don’t recommend playing this game passively as each line of dialogue can hold a single hint as to where to go and what you need to do next. It’s a good thing I suppose then that there is a hint system in the game that you can use if you truly get stuck. The hints are helpful but usually don’t give you the answer outright and as far as I can tell you aren’t penalized for using them. I really liked this entry in the Broken Sword series and long now for all the previous releases to find their way to HD remastered editions on the Switch. While the game doesn’t really incorporate unique HD rumble enhanced puzzles or a touch interface that astounded me, it’s there just not used in the best way, in my opinion. The game is far better than worse. The story campaign will give you a couple hours of story-driven dialogue, puzzle solving, some of which are true brain teasers and an overall great story that wraps up nicely. 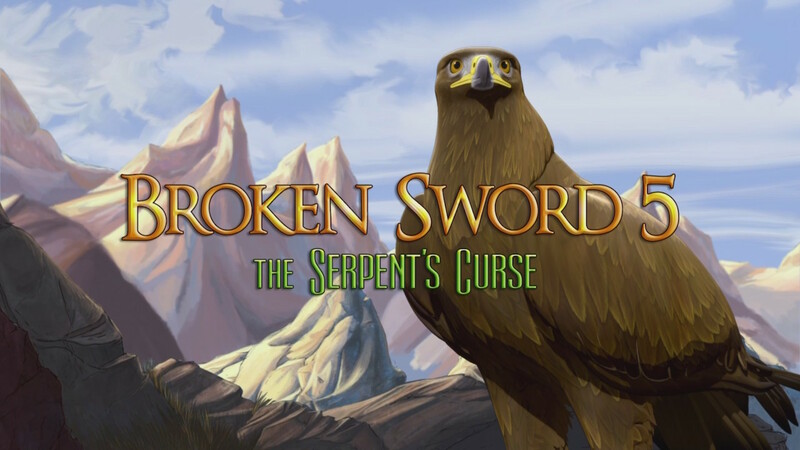 If you can’t tell yet, by my review, I loved Broken Sword: The Serpent’s Curse. The game has a great story revolving around a mysterious painting, a hired thief, and a murder. It’s time to solve the crime and put on your detective hat and help George and Nico solve the case.